The Yugoslavian partisans during the WWII operated also in the Croat coasts that is well known for a series of many islands and channels. Inside such waters, partisans operating in the islands had caused some troubles at the Italian occupation forces that needed to supply its garrisons on the coast using sea routes often with mortar attacks or night assaults. 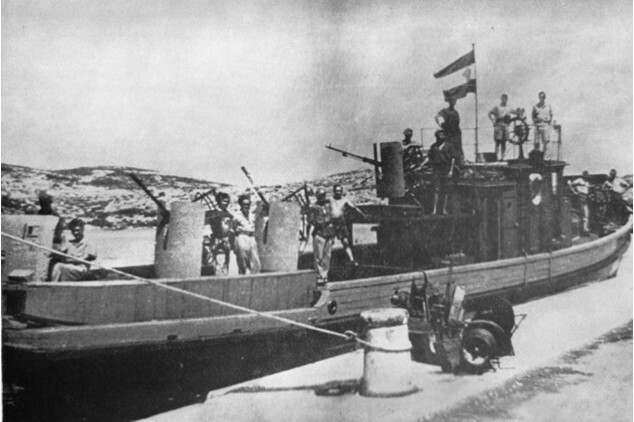 With the surrender of Italians and the relocation of Tito's High Command in the island of Vis (that was free from the Axis control), it was decided to create a Partisan Navy to raid the supply lines of the German forces: their units were divided into gunboats (NB, that could reach 20 meters of length) or patrol boats (PC, smaller but more maneuverable). Both the Partisans and the German forces used a number of light boats (often ex-trawlers or fishing boats) to supply their respective land forces however the German tried to do only some (mainly failed) landing assault to the partisans garrisons while the Partisan Navy focused to fight the German supply boats with true pirate actions. 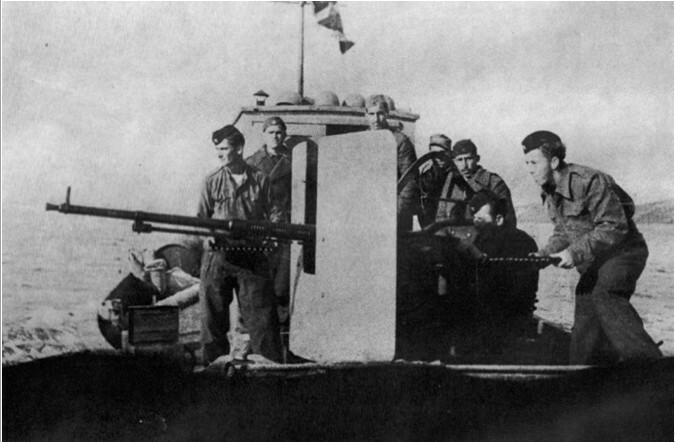 The often unprotected prey were attacked mainly during the night or at dusk (to avoid German aircraft), few warning shots were fired and were thrown threats: if the enemy surrendered, the boat was going to be towed away to Vis island. If the crew resisted, the partisan boarded the prey as a the pirates of the past centuries. German navy tried to use their air superiority, their armed motor torpedo boat and assault crafts with special forces to stop the raids: they managed to sink or destroy some of the larger and more vulnerable partisan crafts of NB series, but they could not stop the Partisan actions. 10 Partisan NB gunboats were lost (even if only 6 by German attacks) while only 1 PC boat of medium size was lost (due accident). Other 13 PC crafts were lost but they were very small boats used as support crafts of larger units (these ones were very little unit, armed only with a single machine gun and usually manned by 3 or 4 sailors, without a cabin and often with an external engine). In coordination with Partisan Crafts, from Vis Island operated also the Royal Navy 61st MBT flottilla, a little British naval unit of half a dozen of armed boats under the command of the Canadian Captain Thomas G. Fuller (nicknamed the Adriatic's Pirate by the British military history). British crafts destroyed, captured or sunk 13 military and supply enemy boats. Captain Fuller in his memories confirm that partisans were regularly used as guides between the channels and the island and took part at the action on his crafts, claiming that the partisans often caused the enemy surrender without a fight with blood-curling threats. That's confirmed with the capture of the biggest British prey: a schooner of 400tons full of supplies that surrendered after a Yugoslavian partisans shouted "don't shot or we will torpedo you" (even if the boat had no torpedoes) and further colorful threats. These units were gunboats, classified as NB, and larger than the most common PC boat. That proved useful in some clashes (as during the assault at the Kornat, or during the Battle of Maun Island when NB-14 faced larger enemy warships) however this also caused a number of losses (differently from the PC class). The Pasman was the ex- Yugoslavian minelayer Mosor (of the pre-war navy) and was the largest military ship destroyed by Partisan Navy. Had a length of 30m and a weight of 142tons, was armed with a 47mm gun and could carry 20 to 34 mines. At the time of the loss the ship was still not decided if to be part of Kriegsmarine or the little Ustasha Navy and was lost before being commissioned (however at the time was in the hands of the Germans). Ship grounded by storm on 31/12/43 and NB-3 captured the crew (24 Germans and 4 Croats), destroying later the ship on 5/1/44 before the Germans could recover her or save the crew. On 3/06/44 claim to have shot down a German aircraft. 1-2/6/44 Battle of Blitvenice: Germans motor torpedo boats S-155 and S-156 attempted to board the Kornat, with a deceive operation. They tried to approach the ship claiming to be British, however the plan was discovered as soon as the first German was onboard: a close-range gunfight battle started, following by an engagement with artillery. In the end Both S-155 and S-156 were damaged and retreated: they also suffered 1 prisoner and 11 wounded. Kornat suffered light damage and 9 wounded. 3-4/11/1943. Fought a battle against the armed boats Marija and Naprijed. Biokovac suffered damage and commander was wounded, also the Germans suffered damage and had 7 wounded. 8-9/12/43 with PC-54 capture Ustasha boat Jadro. 30 Ustasha carried onboard and one German were captured alongside their weapons and a cargo of 90tons of food. 9/10/44 9/10/44 With NB-13, engaged in gunfight the armed boat Angelina: during the fight the partisans suffered 2 wounded on Partizan. But the Angelina was sunk with 3 Germans killed and 9 captured. After the fight, the two units attacked and captured the Adriana without resistance. 23/10/10 Took part at the Battle of Maun Islandwith PC-2, PC-4 and PC-24 against the Kriegsmarine submarine hunters UJ-202 and UJ-208 (ex-Italian corvettes). All the partisan units suffered damages because they were outgunned by the Germans, but only the Pionir suffered 4 wounded. Later the two German ships had a skirmish with British motor torpedo boats (suffering light damages, 3 killed and 11 wounded), and finally they shelled an own German convoy, sinking the armed barge F-433 and damaging others in a friendly-fire accident. Few days later (1 November) the UJ-202 and UJ-208 will fight again close to Pag Island but this time against the British destroyers Wheatland and Avon Vale and both the German ships were sunk. NB-2 Koca (25m and 120tons with 14 crew) was sunk by Kriegsmarine motor torpedo boats (S-36 and S-61). She was the ex-German HZ-9. NB-5 Ivan was an ex- American submarine chaser of SC-1 class and was sunk by Luftwaffe 27/12/43. NB-11 Crvena Zvijezda (the larger boat, 24m with 180 tons and 28 crew, armed also with a 81mm gun) was sunk by a mine 1/04/45 with the death of 22 crew. NB-4 Topcider was renamed УBB-4Ф and turned into an hospital ship. NB-12 Borac (then renamed Partizan-II) ex-fishing boat that was gifted by the Allied to compensate the losses of friendly fire but was never used in action. NB Partizanka (without number) was an ex luxury yacht, not used even if among the weapons there were 3 ordinary 20mm guns, but also 2 multiple rocket launchers. The patrol boats were mainly ex-civilian units armed and used as pirate ships to raid the enemy marine supply lines. They were all different and are classified together only because the similar size, weapons and crew. They proved to be effective in the Croat waters especially during boarding action. PC-1 to PC-4 and PC-21, PC-22 and PC-24 were the most active ships. PC-6 to PC-8 were ex-enemy captured units not much used (only the PC-6 took part at an action, PC-5 it's included between the "light craft"). Also PC-23 and PC-25 to PC-27-II saw less action and at least one used only as transport (there were two ships registered as PC-27, the second one was the most little unit of this series of Patrol boat, being only 4-crew manned but armed with a 20mm and she was the only unit lost in action (due an ammunition explosion). With only a loss during the war, these boats proved to be the best one of the Partisan Navy. 17/12/43 Sailors clashed on coast against an enemy boat, some were killed. 11/11/43 With PC-22 attacked two armed motorboats, but they are repulsed with one wounded. 11/11/43 With PC-21 attacked two armed motorboats, but they are repulsed with one wounded. 5-6/08/44 Fought against the Kriegsmarine minesweeper R-15 and R-16 in Murter Channel . 5/09/44 Fought during the night against an armed enemy boat. Probably Ustasha. 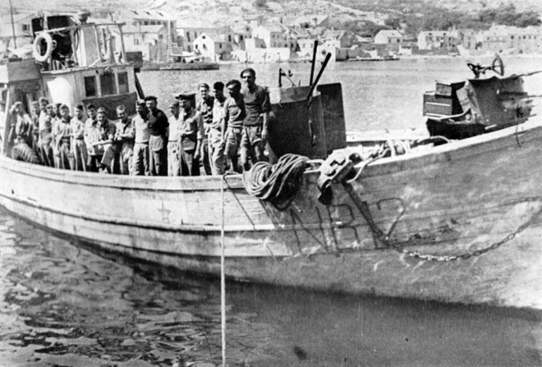 The Lahor was one of the many boats used to transport weapons, ammunitions or partisans and not intended to fight. However 17/12/44 found in Molat island and her crew captured an explosive boat (of Lynse type) one of the Germans was shot and killed by his own officer because refused to sabotage or self-destroy the boat. Light armed crafts (PC-5 and then PC-41 to PC-82) were very little boats usually armed only with a gun of 8mm and with few sailors, they were mainly used as support units to larger ships and not planned for the raiding operations. Some were also ex-enemy units captured and 13 of them were lost during the war by accidents or enemy actions (mainly air attacks).